If you missed #31 click here. Best Moment: Edge Master mode. It's all about Edge Master mode! 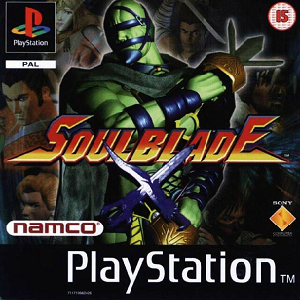 Soul Blade was actually called Soul Blade in America and, confusingly, the game series is called SoulCalibur. Lots of fans who played the Soul Calibur games seemingly forget this absolute gem on the PS1 and it's such a shame. For me, this game is better than any other Soul Calibur game, but, I'm aware I'm in the minority here. 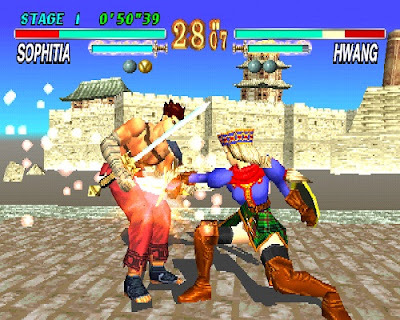 Soul Blade was Namco's experiment to try and create a weapons based fighting game. And boy it worked. On the surface, sure, the general fighting in this game stands out well and is lots of fun. But the real magic for me is in Edge Master mode. Consider "Edge Master" mode to be the game's story mode, you take each character on a journey to try and find and destroy the Soul Blade, taking on the world's best fighters along the way. You also unlock new and better weapons to use. For its time, the concept wasn't really done on a Fighting game to have a Story Mode, and for me it's still one of the best story based fighting games ever made, it's so much fun, despite its difficulty. Seriously if you're looking for a gem of a fighting game on the PS1 that's not called Tekken, then this is the one I'd recommend. Looking for #29? Click here!